Gameplay mechanics are what you'd expect from a Defender clone. It's a tale as old as time of flying in both directions and stopping abductor craft from stealing the assets under your protection. It's a classic formula that has remained un-messed-about-with for a long time and for good reason. 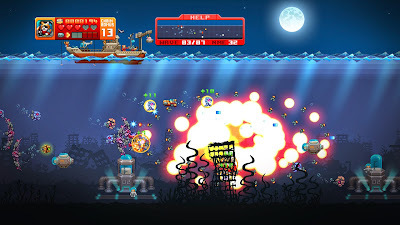 Aqua Kitty brings to the table the kind of zippy, frenzied shooting you'd expect- nay, demand- from a Defender clone. 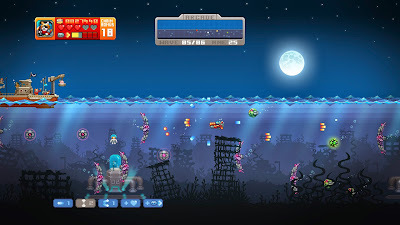 A fine range of powerups is present and the game doesn't throw them at the player with wild abandon. It's not quite a Victorian dad, but it's not "well done on your test, son, your new bedtime is never" either. It makes you work for them, embedding enemies that drop powerups within waves of often fast moving and regularly deadly foes. 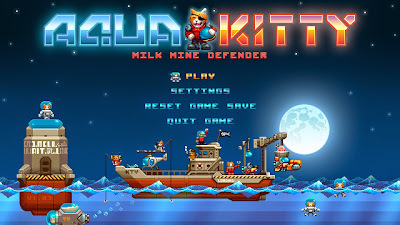 It's worth the effort too, even just to see a pair of diving-suited kitty marines swim alongside your sub, blasting enemies with wild, feline abandon. Graphics come in a soothing palette of sea blues, with a lovely sunset hanging over the milk mine mothership on the sea's surface that adds a wistful edge to the grief you'll invariably experience when a Jellygrab lifts a doomed milk miner through the waves and skyward, where presumably the fish will extract revenge for all the years of cats failing to co-exist with them and getting all up in their bowls. The fish submarines themselves are things of malign beauty, with just the right level of sinister intent to their features. There's a strong influence of the "living fossil" coelocanth in the design of a lot of them, a fish that looks mean as Hell to begin with even before it's reworked as a laser-spewing submersible. The kitty sub is like an X-Com Terror From The Deep reworking of a Battlestar Galactica Viper and is just SO ADORAB- I mean, um, badass. It's badass. The music is sheer chiptune delight and gets pretty heavy metal with it at times, matching up nicely with the tempo of the gameplay that in later levels can quickly escalate from simple dogfight to hectic furball (stop groaning in the back) in the shake of a cat's tail (I said stop, please). 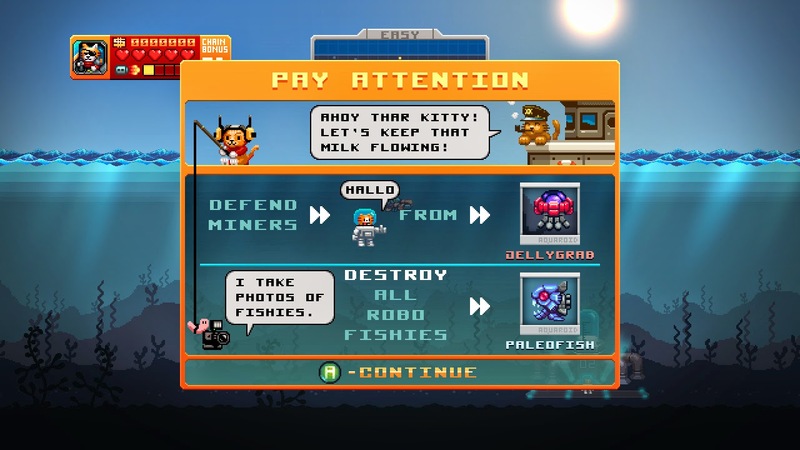 Aqua Kitty is a game that can take its player from idly blasting enemies to furiously bent double at the keyboard, eyes wide and brand new swearwords on the lips as the fish attempt to stop the vital milk-mining process in a matter of minutes. Cute little filigrees like the fact that lost miners appear on the level's end screen as milk cartons with little lost miners printed thereon, and that fact that during the whole hectic, laser blasting thing there's a couple of cats idly fishing from the side of the mothership show the effort and affection put into the game. The "mew" of panic as a miner is abducted is enough to make the most fervent dog person into a feline vengeance machine. It's best to adopt Aqua Kitty: Milk Mine Defender soon, because in true cat fashion it's just going to end up adopting you anyway. 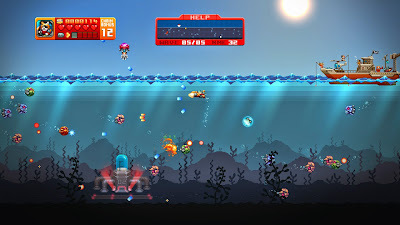 Just a quick line to say that although Ruari is spot on in his review, Aqua Kitty was recently updated for the Steam release with a fancy-pants new 'arcade' mode that adds a Gradius-style power up system to the game. Honestly, if you've not played the game since its original release, or only have the lesser-quality early console versions (Vita/XBox) you really need to check it out. I've not played it in any other mode since. Oh, and with two players (local only) Aqua Kitty ranks up there amongst the best co-operative shmups ever.